This offer is good for US demonstrators only. 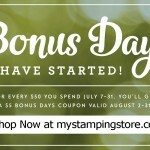 Now is a fantastic time to join Stampin’ Up! As a demonstrator, you can get a discount on new products like Blendabilities and Project Life, and you’ll be able to get in on the preorder for the brand new holiday catalog (starts August 1st)! All starter kit orders must be finalized by June 30, 2014. You can get other items on your wish list with your first qualifying order of $150 or more (order must be placed within the first 45 days). This means you’ll get 30 percent instant income and be able to count it towards their first quarterly minimum. 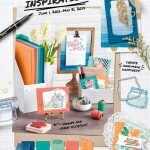 That’s right…you get a discount on supplies as a demonstrator! You save 20% on each order…except the first order! If you place a $150 or more in the first 45 days that you are a demonstrator, you save 30%! 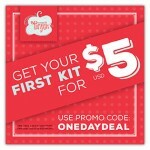 You will fill out an online application and pay for your starter kit. Once Stampin’ Up! receives your application, they will send you a demonstrator ID and access to the demonstrator website where you will place your order and select your Starter Kit items! You will have access to all demonstrator resources at that time! Have a wonderful day!!! 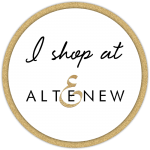 Consider starting your own business and save on your craft supplies by joining Stampin’ Up! with this half price Starter Kit deal!